Edward “Ned” Michael Merrick, Jr.
Former Plainville Police Chief, Edward “Ned” Michael Merrick, Jr. 72, peacefully passed away on Friday, January 5, 2018 at his home in Plainville, MA after a lengthy illness. He was the beloved husband of Donna Marie (Leone) Merrick, with whom this year he would have celebrated his Thirtieth wedding anniversary. Born on June 15, 1945 in Milton, MA, he was the son of the late Edward Michael Merrick, Sr., M.D., and the late Mary Aileen (Mahoney) Merrick. 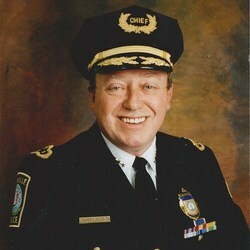 Chief Merrick was raised in Milton and Brookline, MA, and was a graduate of Brookline High School, Class of 1964. 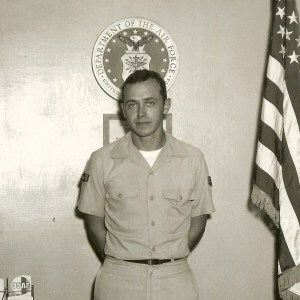 He proudly and honorably served our country in the United States Air Force during the Vietnam War, and later served in the Massachusetts National Guard. He received his Bachelor’s degree in Criminal Justice from Northeastern University in 1978, and his Master’s degree in Criminal Justice from Anna Maria College in 1990. He was deeply involved in advanced training for police officers. Chief Merrick was a member of the Massachusetts Criminal Justice Training Council from 1989 until 1993, and a Certified Instructor from 1987 through his retirement. He also served as adjunct faculty at Anna Maria College and Western New England College. 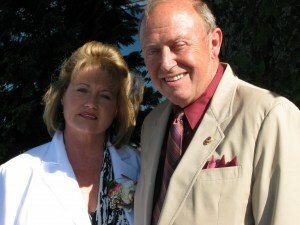 Chief Merrick was for many years a faithful member and long served on the Parish Pastoral Council of St. Martha Catholic Church in Plainville, MA. Well known for his work supporting his fellow police officers, he was the first person to have served as President of both the 18,000 member Massachusetts Police Association (MPA) and the Massachusetts Chiefs of Police Association. Chief Merrick had the honor of serving as the Chief of Police in Plainville from 1995 until 2009. He previously served as a Police Officer in Brookline for twenty-four years, during which time he also worked part-time as Legislative Director for the MPA in the 1980s and 1990s, and was elected President of the MPA in 1998. A familiar figure in State House hearings and conference rooms, he was highly regarded by Governors of both parties and legislative leaders as knowledgeable, reasonable, helpful, and trustworthy on police issues. He participated in many legislative battles, including the MPA’s successful support of the consolidation of the State, Metropolitan District Commission, Registry of Motor Vehicles, and Capitol Police Departments. In 1998, on the same day that the Boston Police Patrolmen’s Union endorsed George H.W. Bush for President, Chief Merrick led a rally of Massachusetts police officers on the State House steps in support of Bush’s opponent, Governor Michael Dukakis. 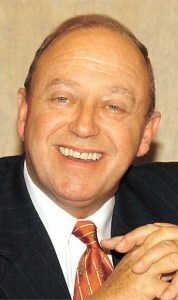 From 1981 until 1991, he was a member of the Commonwealth of Massachusetts Joint Labor-Management Committee for Police & Fire, which facilitated the resolution of disputes between municipalities and their first responders. In 1990, Governor Dukakis appointed him as a member of the State-Wide Emergency Telecommunications Board, which implemented enhanced statewide 911 service. During his distinguished service as Chief in Plainville, he brought his government relations experience to the Massachusetts Chiefs of Police Association, and was elected its President in 2003. From 1997 until his death, Chief Merrick was also a member of the International Association of Chiefs of Police Legislative Committee. During ten years of his fifteen year tenure, Chief Merrick also held the position of Plainville Director of Public Safety, managing the town’s Fire, Ambulance, and Communications operations, as well as the Police Department. Between 2002 and 2008, he was the Chief of Metro-STAR, a one hundred person regional police response team that provided SWAT, Munitions, K-9 operations, and Crisis Negotiation for local police departments. Under his command, the unit provided police security at major events, including the 2004 Democratic National Convention, World Series games, Patriots Play-Off games, and victory parades for the Patriots and Red Sox teams. 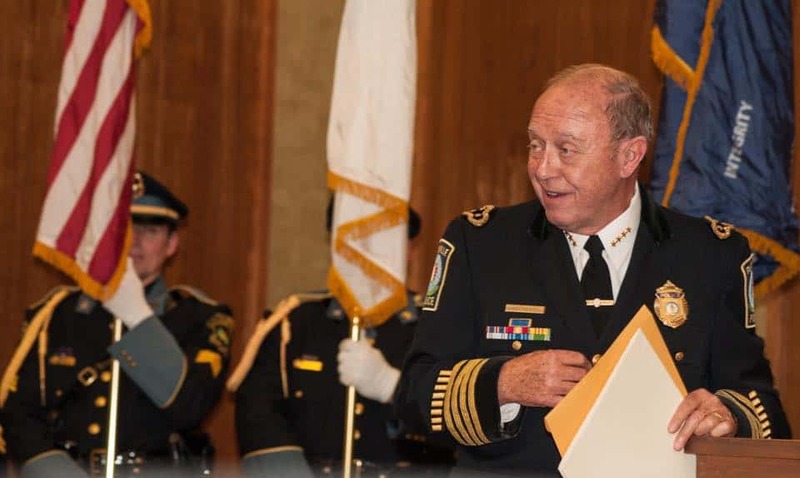 Following his retirement from the Plainville Police Department, Chief Merrick continued his work on behalf of police officers as an officer, board member, and Director of Legislative Affairs for the Massachusetts Fraternal Order of Police. 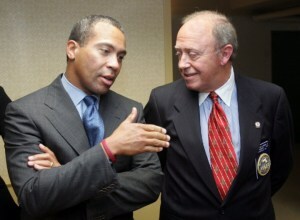 From 2008 until 2016, he served as the Executive Director of the Law Enforcement Memorial Foundation, which raises money to privately maintain a Police Memorial at the State House, and conducts an annual memorial service for Massachusetts law enforcement officers who die in the line of duty. Chief Merrick was long active in fraternal and charitable organizations. He was a member of the Lions Club since 1994, and was elected District Governor in 2009, and a Director of the District Eyemobile program. 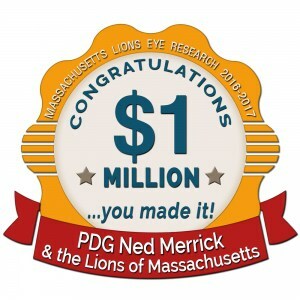 In 2016, after he was diagnosed with his final illness, he undertook the Presidency of the Massachusetts Lions Eye Research Fund. During his term in office, he raised over one million dollars, a goal reached only three times in the foundation’s Seventy-three year history. 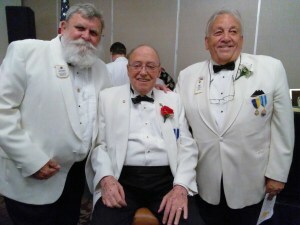 A member of the Benevolent and Protective Order of Elks since 1981, he was named District Deputy in 1991. 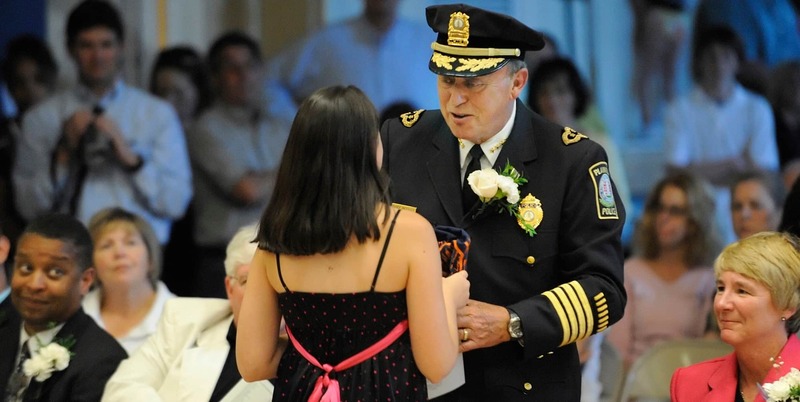 Chief Merrick was particularly devoted to Cops For Kids With Cancer, serving on its board from 2010 until his death. In addition to his wife, Donna, Chief Merrick leaves his loving children: Lynne Merrick Nagle; Edward M. Merrick III and his wife, Susan Merrick; and Stephen Merrick and his wife, Christina Merrick, all of Marshfield, MA. 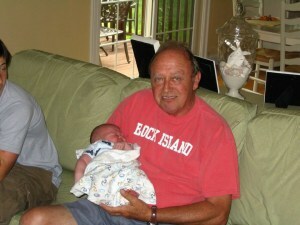 He was the proud and adoring grandfather of Jeffrey Nagle, Edward Michael Merrick IV, Connor Merrick, Joseph Merrick, Stephen Merrick, and Isabella Merrick, all of Marshfield, MA. Chief Merrick was the brother of Lee Ellicott of Porter, IN; Viki Merrick of Woods Hole, MA; Brian R. Merrick and his wife, Rebecca Merrick, of West Barnstable, MA; John H. Merrick and his wife, Joanne, of Manchester, NH; and Christopher Merrick, and his wife, Barbara Merrick, of Kingston, MA. He was predeceased by his twin brother, the late Carl G. Merrick; and his late siblings: Michael Merrick, James Merrick, and Ann Klein Dale. He is survived by twenty-four nephews and nieces; his brother-in-law, Kevin S. Leone of North Attleboro, MA, and his fiancée, Kimberly Macallister, of Centerville, MA; his extended family, many dear friends, and his faithful companions: “Ollie” and Tessa”. Chief Merrick leaves behind all of the honorable men and women of the Police Departments with whom he had the distinct privilege of serving. Members of the police departments will privately pay their final respects to Chief Merrick on Sunday, January 14, 2018 from 1:00 p.m. – 2:00 p.m. in the “Memorial Chapel” of the Dyer-Lake Funeral Home, followed by a Necrology service offered by the Plainville Lions Club from 2:00 p.m. – 2:15 p.m., and by a Family Prayer from 2:15 p.m. – 2:30 p.m. The doors to the funeral home will be open to the general public on Sunday, January 14, 2018 from 2:30 p.m. – 6:30 p.m., so that family and friends may gather to honor and remember Chief Merrick for a Visitation with full Police and Veteran’s Honors in the “Memorial Chapel” of the Dyer-Lake Funeral Home, 161 Commonwealth Avenue, Village of Attleboro Falls, North Attleboro, MA. Relatives and friends are cordially invited to attend a Mass of Christian Burial on Monday, January 15, 2018 at 10:30 a.m. at St. Martha Catholic Church, 227 South Street, Route 1A, Plainville, MA. Burial services will immediately follow in St. Joseph Cemetery, West Roxbury, MA. 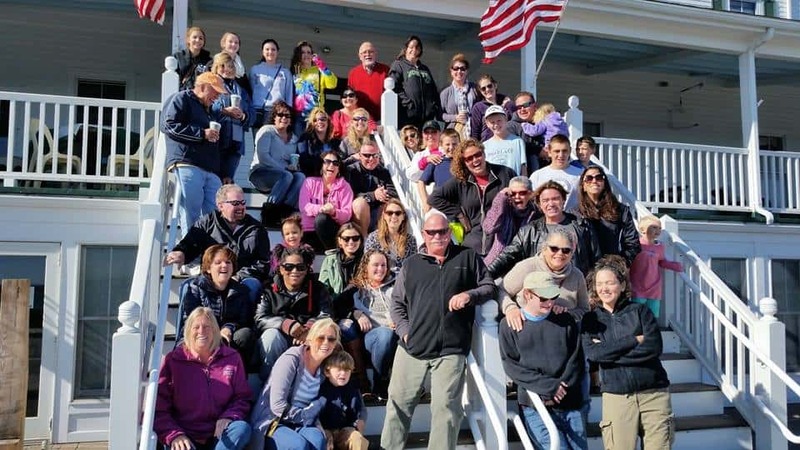 In lieu of flowers, donations may be made in memory of Chief Merrick to either Cops for Kids with Cancer, Inc., Attn: Deputy Chief Rafferty, c/o Canton Police Department, 1492 Washington Street, Canton, MA 02021, Massachusetts Lions Eye Research Fund Inc. c/o PDG Dr. James Roth, 43 Stewart Terrace, Belmont, MA 02478 or to the Plainville Lions Club, P.O. Box 1804, Plainville, MA 02762.